MERIDIAN, Idaho (June 5, 2018) -- June is National Dairy Month, and to celebrate it Dairy West is hosting a community dairy tour June 22 from 10 a.m. to 3 p.m. at Jackson Family Farm at 2365 W. Victory Rd. in Meridian. The event is free and open to the public. Participants will get to see what it's like to work on a dairy farm, meet a multigenerational dairy farm family, go for a ride on a hay wagon, and enjoy ice-cold chocolate milk. Smoky Mountain Pizzeria Grill will be handing out slices of pizza, too. According to Dairy West CEO Karianne Fallow, it's important to connect people with farms so they know more about where their food comes from. "Studies show Americans think about food production constantly, but most people know very little about how food actually winds up on their table," Fallow says. 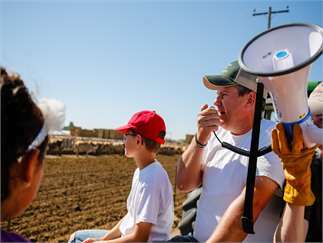 "Farm tours like our National Dairy Month celebration at Jackson Family Farm help demonstrate how farmers and ranchers share the same values as everyone else when it comes to environmental stewardship and animal care." Plus, she says there's a lot to celebrate about dairy. "Dairy foods taste great, they're accessible almost anywhere, they contain nine essential nutrients, and they come in a variety of options from lactose-free to low-fat, fat-free, and low-sodium," Fallow says. "Dairy foods are also very affordable. In fact, you can enjoy three servings of milk for less than $1 a day. And dairy foods can help you recover faster from physical activity and may help you better manage your weight and reduce your risk for high blood pressure, osteoporosis and certain cancers." Dairy West is a regional dairy promotion organization established in 2017 to represent dairy farmers, processors, and supply chain partners in Idaho and Utah. A Qualified Program regulated by the USDA National Dairy Promotion & Research Board, the 501(c)(6) organization raises awareness of the importance of dairy farming, promotes the health and nutritional benefits of dairy foods, and encourages global demand for Idaho and Western U.S. dairy foods through coordinated marketing and communications efforts, nutrition counseling, and research programs. Visit DairyWest.com for more information.